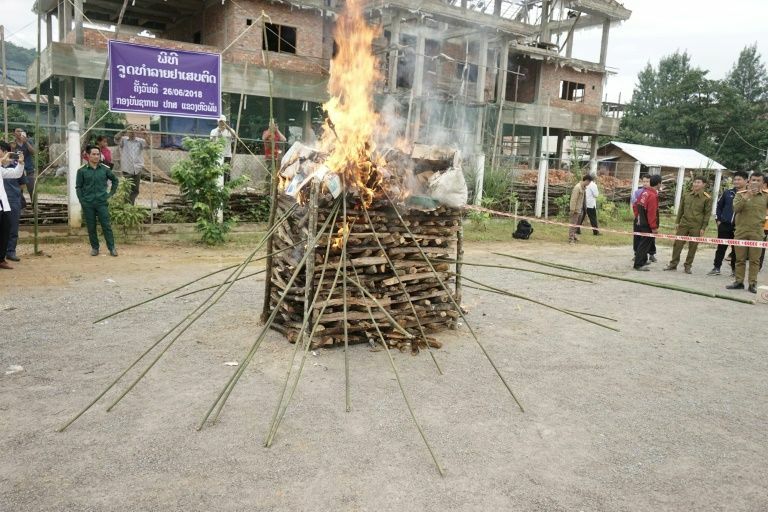 VIENTIANE: Laos drug officials torched around 40 kilogrammes of heroin and tens of thousands of “yaba” pills Tuesday, a small but significant fraction of the narcotics burned on World Drug Day in a region awash with illegal substances. The ceremony was among several destruction events that took place across Southeast Asia, home to the infamous “Golden Triangle” — a zone bisecting Thailand, Myanmar, China and Laos that is the world’s second-largest drug producing area. Record amounts of methamphetamine pills and “ice” — the highly addictive crystallised version — are pushed out across the region and as far as Japan and Australia, prompting massive seizures this year. Sharing borders with five countries, poor and landlocked Laos is a key transit route for Myanmar-made meth as well as a producer of opium, the raw ingredient of heroin. On Tuesday, AFP was given rare access to the ceremony in the reclusive communist country, held to mark the International Day against Drug Abuse and Illicit Trafficking, as it ramps up efforts to tackle the multi-billion dollar trade. Bricks of grey-coloured heroin and piles of vanilla-scented yaba pills — which contain caffeine and methamphetamine — were torched in Xam Neua, a small northeastern town that is a gateway to Vietnam and a popular trafficking route. “Here in Southeast Asia, methamphetamine markets continue to expand,” said Erlend Falch of the UN Office on Drugs and Crime (UNODC). Mountainous, sparsely populated and with porous borders, Laos is a well-used route for drug traffickers. Authorities have had some success in stemming the trade but say increasing cross-border cooperation is the only way to combat the drug manufacturers in Myanmar’s lawless Wa State and the crime gangs that distribute their product. Myanmar marked World Drug Day with its own dramatic torching ceremonies, setting a huge stockpile of pills, cannabis, heroin and opium on fire in the former capital Yangon. The country also hosted ceremonies in Mandalay and Taunggyi, destroying narcotics worth $187 million in total, officials said. Thailand began its torching of drugs earlier, destroying more than six tonnes of narcotics on Monday, the bulk of which was methamphetamine. Major seizures worth tens of millions of dollars have shattered records across the region this year, including a $45-million of yaba and crystal meth from Myanmar discovered in Bangkok last month.